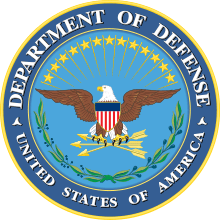 The Defense Logistics Agency (DLA) is an agency in the United States Department of Defense, with more than 26,000 civilian and military personnel throughout the world. Located in 48 states and 28 countries, DLA provides supplies to the military services and supports their acquisition of weapons, repair parts, and other materials. When Secretary of Defense Robert S. McNamara assumed office in the spring of 1961, the first generation of single managers were handling roughly 39,000 items by procedures with which the Services had become familiar. Yet, it was clear that the single manager concept, though successful, did not provide the uniform procedures that the Hoover Commission had recommended. Each single manager operated under the procedures of its parent service, and customers had to use as many sets of procedures as there were commodity managers. Secretary McNamara was convinced that the problem required some kind of an organizational arrangement to "manage the managers". On March 23, 1961, he convened a panel of high-ranking Defense officials, and directed them to study alternative plans for improving DOD-wide organization for integrated supply management, a task designated as "Project 100". The committee’s report highlighted the principle weaknesses of the multiple single manager supply system. An even more dominant theme for the 1990s was the agency’s efforts to reorganize so that it could support the war fighter more effectively and efficiently. In August 1990, Defense Contract Management Regions Atlanta, Boston, Chicago, Los Angeles, and Philadelphia were re-designated as Defense Contract Management Districts South, Northeast, North Central, West, and Mid Atlantic respectively. Defense Contract Management Regions Cleveland, Dallas, New York City, and St. Louis were disestablished. Defense Contract Management Districts Mid Atlantic and North Central were disestablished in May 1994. In the traumatic days and weeks following the September 11, 2001 attacks at the World Trade Center and the Pentagon, the U.S. military faced its greatest challenge since the last world war. Indeed, the U.S. military effort to overthrow the terrorist-supported government in Afghanistan soon came to be called the global war on terror. As it has been in times of war and peace for the last 45 years, the DLA responded in support of the U.S. Armed Forces for Operation Iraqi Freedom. In support of Operation Enduring Freedom, DLA has processed more than 6.8 million requisitions with a total value of more than $6.9 billion; provided $21.2 million in humanitarian support (3.5 million pounds of wheat, 49,000 pounds of dates, 3.8 million humanitarian daily rations and 30,000 blankets) and supplied more than 2.3 billion US gallons (8,700,000 m3) of fuel. Also, in support of Operation Iraqi Freedom, DLA has processed 6.4 million requisitions with a total value of more than $6.89 billion, provided more than 180.5 million field meals, provided nearly 2 million humanitarian daily rations for displaced refugees and supplied more than 3 billion US gallons (11,000,000 m3) of fuel. As action on the war front wanes, the DLA mission does not. The Agency continues to supply 100 percent of food, fuel and medical supplies, as well as most of the clothing, construction materials, and spare parts for weapons systems for the forces that remain during the reconstruction of Iraq. DLA also supports redeployments, including conducting battlefield cleanup such as removing equipment and debris and even hazardous materials. Interestingly, DLA has carried out its stepped up mission employing only 26,000 people, which is down from 65,000 workers in 1992. The Agency’s military force includes slightly more than 500 on active duty with the Army, Navy, Air Force and Marines, along with nearly 800 reservists. In 2005 DOD identified DLA as the single DOD agency to manage multiple aspects of supply and storage processes as part of the Base Realignment and Closure Act 2005. Later that year, the DLA distribution systems increased to 26 Distribution Depots worldwide. Under BRAC, in 2007, DLA Warner Robins, Ga., was established as the first DLA storage and distribution operation at an Air Force air logistics center. In 2007, DLA extended its enterprise to 48 states and 28 countries, working hand in hand with military services around the globe. Towards the end of the 2000s, the DLA Maintenance, Repair and Operations Uzbekistan Virtual Storefront warehouse officially opened for business on November 16, 2009, for troops in Afghanistan to see exactly what types of construction materials are available to them in the region. DLA continued to upgrade aging logistics systems. The Defense Logistics Management Standards Office implemented the Defense Logistics Management Standard System throughout the Defense Department in October 2009. The system replaced the Military Standard Logistics System, known as MILS, used to conduct daily logistics business for more than 40 years. To better serve its customers in Europe, Defense Logistics Agency Europe and Africa consolidated all personnel from Wiesbaden, Germany, to Kleber Kaserne in Kaiserslautern on July 24, 2008. DLA completed BRAC recommendations to privatize the purchase of tires for military vehicles, packaged petroleum and lubricants, and compressed gases in 2010. In the last decade the world has been battered by earthquakes, tsunamis, floods, hurricanes and other natural disasters. In each instance DLA responded with supply and personnel support where needed. A 7.6-magnitude earthquake struck Pakistan, India, and Afghanistan at 8:50 a.m. local time on October 8, 2005. The epicenter was located near Muzaffarabad, the capital of Pakistani-administered Kashmir, about 60 miles (97 km) north-northeast of Islamabad. A total of 14 commercial 747s were required to move the 506 air pallets built by DLA and shipped to Pakistan. The last shipment arrived November 23. In addition to these materials, 9,720 cases of Halal meals, or 116,640 individual pre-packaged meals, produced through DSCP for the Combined Forces Land Component Command, were sent to Pakistan to provide immediate feeding to refugees and survivors. The Pakistan earthquake relief effort continued throughout the winter. In July 2010, DLA began renaming field activities to clearly and concisely identify how each contributes to the mission of warfighter support. This effort, referred to as "We Are DLA", is the Agency plan to bring all DLA activities together in both name and spirit. The first step is to create a “single agency” environment, internally and externally, building a greater sense of community and ownership for our employees, creating a clearer and more definitive identity for customers and stakeholders. 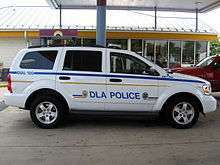 DLA Police patrol their Headquarters in Fort Belvoir, Virginia. The Headquarters and five additional facilities (Fort Belvoir, Virginia; Columbus, Ohio; Richmond, Virginia, Susquehanna, Pennsylvania, and San Joaquin, California) are patrolled by the Defense Logistics Agency Police Department, which provides around-the-clock force protection, antiterrorism, and security and law enforcement operations through police services, emergency response, and protective countermeasures for the Agencies' installations and facilities in order to protect civilian and military personnel and property. The Defense Logistics Agency Police Department is part of the Office of Security and Emergency Services. ↑ United States General Accounting Office (May 2004). DOD Business Systems Modernization: Billions Continue to Be Invested with Inadequate Management Oversight and Accountability (PDF). Washington, D.C.: GAO-04-615. ↑ "From the Director" (PDF). Loglines. Defense Logistics Agency. October 2011. ↑ Military Logistics Forum (2011). "Genealogy of the DLA" (PDF). KMI Media Group. Retrieved April 10, 2015. ↑ "DLA Aviation". Defense Logistics Agency. Retrieved April 10, 2015. ↑ "DLA Police". Website of the Defense Logistics Agency. Defense Logistics Agency. Retrieved 3 July 2013. ↑ "DLA Police Locations" (PDF). Website of the Defense Logistics Agency. Defense Logistics Agency. Retrieved 3 July 2013. ↑ "A Message from Staff Director DLA Installations Support Security and Emergency Services" (PDF). Website of the Defense Logistics Agency. Defense Logistics Agency. Retrieved 3 July 2013.